Yesterday I went shopping at one of the local organic stores that I don’t go to very often but I’m glad I did! I got a few great deals on organic produce that didn’t cost me more than non-organic produce…love. I got bag of potatoes for $2.50, bananas for $.69 a pound, and a bag of 5 sweet peppers for $3.79. Did read that right? FIVE peppers…that’s a great deal not being organic. I spent right about $8 and was thrilled. It is possible to shop healthy for decent prices. I did some dealin’ yesterday cause I went to Hobby Lobby and got cute stuff for the basement, all 66% off. I paid less than $4 an item…will show later when it’s complete. 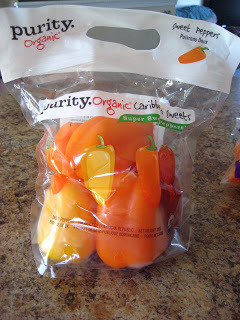 Here’s a pic of the peppers cause I thought the bag was so cute. Now on to the garden. 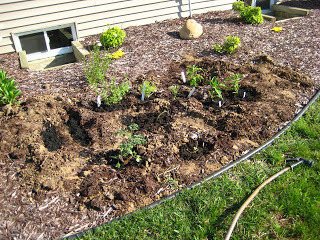 I decided to plant my veggies in the landscaping out back because we just weren’t finding time to go get the supplies for a new box (I gave away my box prematurely so it’s gone…I regretted it as it was being carried away…note to self, never do that again!). So we improvised and stuck it out back. I did want the plants close by to keep an eye on them, so it works out. Here’s a pic…doesn’t look the “prettiest” at the moment. I have to put up the tomato cages Kyle’s aunt Pam gave me tonight. These are things I’ve planted, Roma and cherry tomatoes, peppers (Pino something is the name), mini yellow peppers, carrots, spinach, Italian oregano, basil, cilantro, and a raspberry bush (not in pic)! I’m going to make salsa with all my ingredients (with Aunt Pam). I had this salsa that my sis (Jenner) made with friends and it was amazing! She has graciously gotten the recipe and given to me. Wahoo! Excited for my stuff to come up!